I’m beginning again as everyone who writes must. My desire to write is like a hardy pansy that survives through winter. As leaves and blossoms hunker down and hold on. 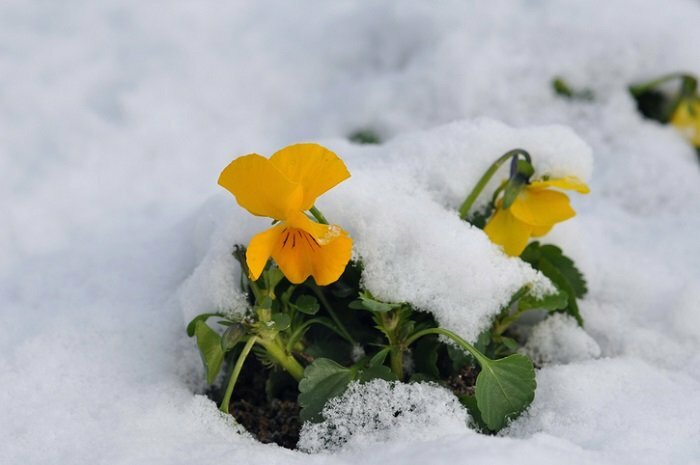 Your photo so reinforces your words, the snow is like an image of your words “My will to write falters,” yet the yellow of the flowers is the light that “push[es] back against/ the trembling quiet.” So brief, yet so lovely. Thank you for responding! I had a health issue that took away my energy to write for several months. I knew I needed to get started again. This community is so supportive. The pansy is so beautiful, I am sure you will write again.